Whether you are an experianced yoga asanas practioner or a newbie who is just beginning to start Balaasana, the best cheap yoga mats should give good cushioning, slip free, and easy to maintain.Therefore, in order to enjoy performing all asanas, you need to define your personal space and have a firm ground support. Good yoga mat gives this. Yoga mats are of a specified size and artificially manufactured material in order to provide a cushioning effect to the body as a whole without injuring the pressure points like knees, elbows, ankles etc. Ancient yogis originally practiced yoga on a plain grass surface, then on skins of animals, such as deer or tigers. The animal skins provided protection against sensitive skin and more cushioning and grip than the bare ground. Using animal skins became rather impracticable as the practice of yoga grew in popularity world over. Earlier towels and cotton mat-like sheets were used to support themselves. As yoga grew its popularity an English yoga instructor named Angela Farmer, found an alternative to the age-old practice of using towels or cotton paddings. She created a padding using a piece of foam carpet. Later this became one of the regular yoga accessories. Nowadays using a yoga mat has become a must for every yoga aspirant.Enjoyment while performing the various asanas in hatha yoga can be derived completely using a yoga mat. A yoga mat should be solid, with good cushioning, sticky and odorless. Frankly, when I started yoga I was practicing on double folded blankets at that time there was not much craze of using a yoga mat. Five years back I started using yoga mat and have experienced the real benefits of using it. Thickness (normally between 4 mm to 6 mm) of the mat is consistent throughout the are area.This is not the case in blankets. A better insulation between the floor and your body. This is very essential while doing yoga. Heat generated in your body should not be allowed to transmit to the floor. If you are not using a mat or any surface not sufficiently insulating your body from the floor, the purpose of doing yoga is lost. Edges of the mat do not fold in certain poses especially while performing the Surya Namaskar asana unlike in blankets there is every chance of the edges folding and causing injury. Adequate cushioning is required on the pressure points while performing Sarvanga asana, Shavasana which is very weak in case of blankets. The surface of the yoga mat should be slip resistant. This is an essential requirement for yoga mats. Normally all floors are hard and slippery, the texture of yoga mat prevents skidding while performing certain poses. Yoga mats are easy to clean. A clean mat keeps your mind fresh to perform any yoga poses better. The practice of yoga dates back many centuries in India, however, benefits of performing yogic poses, kriyas, and meditation was known to most of the world a few years back. This popularity has increased the number of yoga studios and yoga classes, therefore many people are spending an enormous amount of money on various yoga accessories. 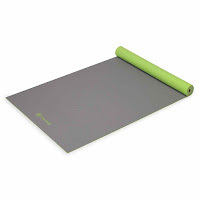 Yoga mats are one of these accessories that are purchased by many be it yoga aspirant or newbie. My goal is, therefore, help anyone select the best yoga mat and the best affordable yoga mat to get their money's worth. If you typed yoga mat on Amazon.in search you would get about 13000 results, which is a very large for any serious yoga practitioner interested in buying the best inexpensive yoga mat online. I have tried my best to narrow down list making it simpler to decide what is best suited considering the quality and cost.I have read many yoga mat reviews,tested them practically and have identified what should be the best parameters that decide the best yoga mat. 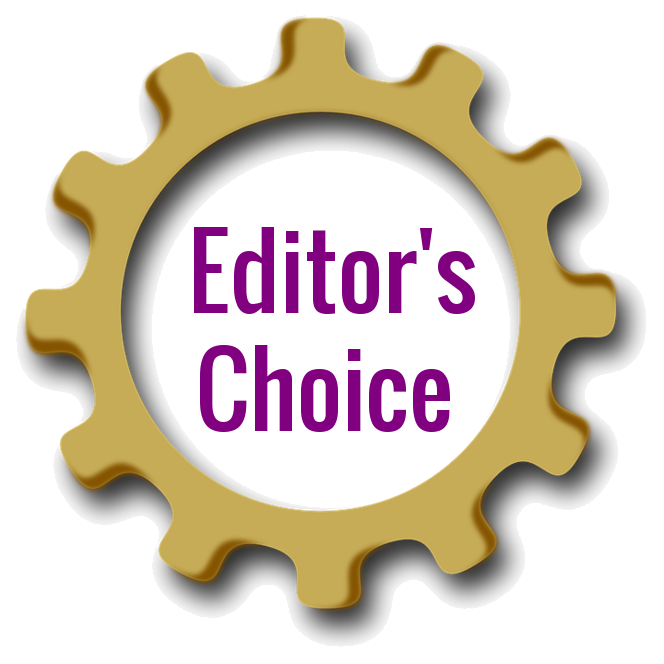 I have also spent hours reading and analyze reviews published in Amazon customer reviews section to come to a conclusion. I have tested a few mats myself and have found that in most cases the shapes are same but the sizes and the material vary from brand to brand. I have my own yoga mat and have tested various yoga mats my colleagues were using during the training session. My assessment of a good quality,top rated yoga mats was based on the following 9 parameters. Weight - how easy is it to carry? Easy unrolling - did the mat remain flat? or ends required pressure to make it flat? Smell - was there any smell? Durability - does the mat surface get worn out after a constant use? this infographic on 'how to choose the right yoga mat'. A quick guide to buy the best yoga mat. Here is my list of 9 yoga mats tested during the yoga session I attended, followed by a short analysis of my favorite mat’s key features. You cannot get a mat that satisfies all the above parameters. There are flaws of minor nature but does not disqualify purchase. Jade Harmony Yoga Mat 4.75 75"longX24"wide 7.05 Rubber 4.6/5 1797 Here! 6 74"longX24"wide .05 Memory foam 4.4/5 59 Here! 4 72"longX24"wide - elasticized-fabric 3.2/5 131 Here! 10 72"longX24"wide 1.8 Rubberr 3.7/5 36 Here! 6 68"longX24"wide - Foam 3.8/5 449 Here! 4 68"longX24"wide 1.1 Rubber 3.2/5 25 Here! 3 68"longX24"wide 2.2 PVC 4/5 490 Here! 6 68"longX24"wide - PVC 3.8/5 269 Here! 6 68"longX24"wide - Rubber 3.2/5 67 Here! All the headings are self-explanatory. 3/16"(4.75 mm) slim mat specially designed anti-slip and sweat absorbing material allowing you to grip the floor for balance while protecting your pointy joints. 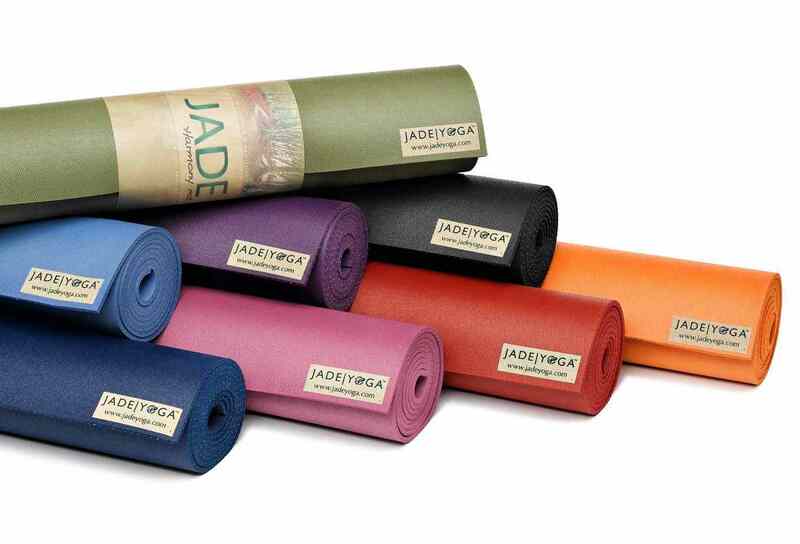 Jade Harmony Yoga Mat is a complete rubber mat sourced from rubber trees. The main advantage is that it absorbs a lot of moisture and helps maintain traction in sweaty situations too. Rubber offers a firm grip both between the mat and your body and mat and the floor on which you perform yoga. The surface appears like tiny vacuum pumps sucking your hands and feet and you will never slip during any yoga poses. Therefore, it highly sticky. In fact, such high-quality rubber mats are used in various yoga centers.This is a perfect mat for performing Surya Namaskar. Though the mat is 4.75 mm or 3/16" thick, it provides sufficient cushioning to your pointed bones and prevents any injury. This mat weighs 3.2 Kg which is 7.05 lbs, which quite heavy in its class. This mainly due to the dense structure of rubber.Very durable and can last long even if used for hot yoga. Unrolling is excellent, you do not have to make the edges flatten after unrolling. This mat is equally spongy, which means it absorbs sweat making very suitable for hot yoga also. You can also wash this material to remove the sweaty smell after prolonged use and increase its longevity. Jade Harmony mats aren't light to carry easily. This 7.5 pounds mat can pose inconvenience while walking to your yoga class. The odor of any natural rubber product mat, designed to absorb sweat is unavoidable. Normally this smell lasts for few days after it is unpacked. It is an inherent property of all natural rubber mat. However, if proper maintenance and care are taken you can prevent the pungent odor and also prolong the longevity. Because the mat material is rubber it contains latex, so latex allergy persons can stay away from this option and opt for our rubber free options. See rubber free mat options. All rubber mats are not recyclable, therefore we recommend repurposing a worn-out yoga mat. 3 mm slim mat compressed PVC material specially designed anti-slip, adequate cushioning and support like our top pick. There is no pungent rubber smell and suitable for those with latex allergy. Gaiam Solid Yoga Mat is suitable for people who are allergic to latex or people who cannot bear the pungent smell of rubber. This mat is made of compressed PVC and free of the Phthalates DEHP, DBP, BBP, DINP, DIDP and DNOP. It is an artificially manufactured material but still, it provides;sufficient support, size options, and stickiness. This mat has two different surfaces. the top a smooth, shiny area (sticky) and a textured bottom side (slip free). The cushioning effect is perfect and so far there are no complaints of pointed joint aches. The personal space covered by this mat 68" X 24" which is standard for all. This mat easily unrolls and you do not have to put any pressure on the edges to flatten them. This is a very lightweight option helping you to carry anywhere with ease. Gaiam also offers other different varieties of mats. Check below for more information. This mat is manufactured from PVC and because of this is a weak moisture absorbent. That means in hot yoga classes you may have a pool of sweat around you. However, it is very easy to wipe out the sweat without even a single drop absorbing into the mat thus leaving the mat clean without any sweat smell. Alternatively, you can also use a yoga towel over the mat to absorb the sweat which can also be washed in a machine. 6 mm yoga mat with a three-layered special material. The textured top layer which is slip resistant, middle memory foam to provide cushioning to your pointy joints and bottom non-skid layer to anchor the mat to the floor.All three sandwiched together to give a nice balance between all the requirements of a yoga pat. The Strauss Yoga Mat is what you need for all your yoga exercises at home.It is the best budget yoga mat suiting to everyone's need. This mat is made up of three layers to fulfill all the requirements of a professional yoga mat made available to you at a most competitive price. Take a look at the cross-section of Strauss yoga mat. The entire 6 mm thickness is divided into three layers. The textured top layer provides slip resistance ensuring maximum grip to your hands and feet. The middle Memory foam layer provides adequate cushioning to your knees. 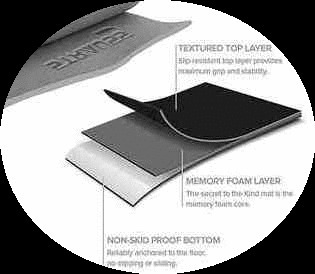 The bottom non-skid layer provides perfect adhesion between the mat and the floor. The personal space covered by this mat 68" X 24" which is standard for all. The mat can be rolled up easily and stored in the rolled up condition reducing space. Easily washable and dried. This material is durable and resistant to wear and tear. This mat is light and can be carried everywhere. People allergic to latex can use these mats conveniently since they are free from latex. Not all yoga aspirants can spend on high-quality mats, this mat can fulfill their yoga requirement with low investment. It is one of the best cheap yoga mat. This mat has some odor but definitely much less and pungent than the rubber mats. As far as the durability is concerned these mats are less durable and tends to get worn out if overused. Being cheaper one cannot expect a higher life. Depending on the usage and maintenance of the mat you need to change the mat when you observe the first signs of wearing.My estimate is that this mat should last for at least a year (usage 5 days a week) if properly maintained. The Sivan Health and Fitness Yoga Mat are 1/2″ thick. The yoga mat material is a specially designed memory foam, meant for impact absorption and comfort. All your pressure points are well protected while using this mat. It is more useful for people who have difficulty in performing various kriya's in the vajarasana position for a long time. People who have sensitive knees will find it comfortable to use this mat.This is the best yoga mat for beginners. The mats total area measuring 71” x 24” ensures complete coverage for people of all shapes and sizes. 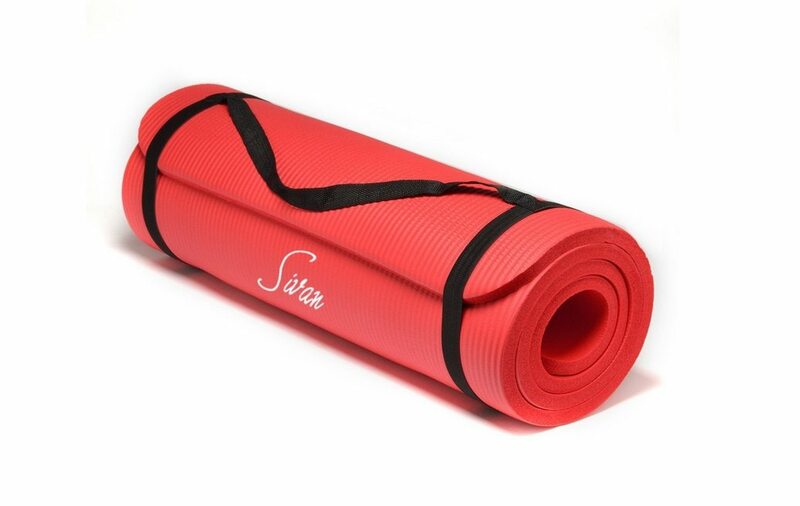 Sivan Health and Fitness Yoga and Pilates Mats are manufactured from durable and long lasting NBR Foam. It is an ideal mat for all types of yoga, especially restorative poses. This yoga mat has ridges on the bottom side that prevent the mat from skidding on a smooth hard floor while the top surface is smooth and sticky for comfort.Should practice barefoot on this mat.Avoid shoes. A simple carry strap comes along with the mat for tying and carrying the mat with ease. This feature allows you to take your yoga mat wherever you go. The weight of this mat is only 1.8 lbs making it easy to carry. There is no repulsive smell in this mat, unlike the pure rubber mats. The smooth top surface does not create any prints of your feet and hands due to your weight while exercising, instead, it bounces back to its original shape quickly. As the mat is too soft, it can pose some balancing problem while performing Vrikshasana - Tree poses for beginners. Those who are experienced will not have problems. Heavy persons should avoid the use of extra thick mats for yoga since the pointy joints may sink deep into the foam and can face balancing problems, especially Surya Namaskar. Sitting and lying down poses are very comfortable. Like Vajrasana, Padmasana, Shavasana can be practiced easily. 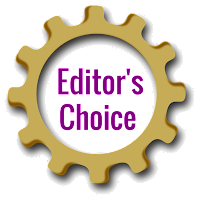 I have reviewed all the 9 mats of which the Jade Harmony is my favorite followed by Gaiam and Strauss which fall under the category rubber free and inexpensive options respectively are my alternate recommendations though not comparable to the 'editors' choice. Sivan is meant for beginners who start with the practice of various breathing exercises and mild asanas not involving tough movements. It is also good for people who have recovered from leg injuries. I have tested Curveit MUDRA Yoga Mat, which is 72" X 24" X 6mm memory foam mat. It is longer than the normal mats sold in the market. A taller person can lie down in Shavasan very comfortably. Initially, when it is unpacked I could get the smell of the foam but subsided after some time. Its 6mm foam provides enough cushion, with the bottom side with ribs to grip the hard floor. I tried it on a concrete flooring where the grip was good, but on a hard smooth surface, the grip was weak. When it was unrolled the edges need to be given some additional pressure to flatten it. One of my team members was using Quick Shel Red 4mm Yoga Mat. This looks very attractive. The very first sight gave me an impression that it is a red carpet. Actually, it is made up of some elastic fiber. It is an eco-friendly material and machine washable. It is a very light yoga mat and can be easily carried. Absolutely no smell when you unroll. I had some difficulty performing the doggy pose. I found that the material was hard and did not have sufficient cushion beneath my knees. My concentration was only on my knees because it was hurting me. Miss U Eco-Friendly Yoga Mat has a workable space of 72 " x 24 " and 4mm thickness. The yoga class was brightly lit because of its color. It was bright red and the only mat found in the class with that color. I found it spongy, adequate cushion to support my knees and equally great grip. It was the lightest mat so far tested (1.8 lbs). This mat is 100% recyclable, biodegradable and made of odor-less, UV resistant TPE material. It is also free from PVC, phthalates, silicone, latex and other toxic materials.Which means it is not going to do any harm to the body. It is reversible mat too. Trying so many mats one after another made my hands sweaty and I found that the mat was not absorbing moisture and was slippery. Well, under dry conditions the mat was OK.
Reebok probably is the first name that comes to mind when you think about buying a sports shoes, men's clothing, but the brand has made a great entry into the yoga accessories for yoga aspirants who want a Reebok yoga mat that is competing with higher end mat manufacturers. This attractive mat catches everyone's attention at any yoga class. It is a comfortable mat giving you good sticky experience for most of the yoga poses and adequate pointy joint cushioning for its compact size of 64" X 24"X 4mm thickness. This mat is meant for average height people and its top smooth surface will not give enough grip for hot classes and sweaty sessions or people who tend to sweat a lot during normal sessions.The mat has a poor moisture absorption characteristics because of its dense PVC material. AmazingHind Yoga Mat non-slip yoga mat provides stability during Yoga or Workout.This imported yoga mat is made of a kind of foam and can be used on any hard surface without slipping. Any normal height person can use this 68" X 24" X 6 mm thickness effectively. Due to its 6 mm thickness, cushioning is adequate and can perform standing, doggy poses or lying down asanas with ease. Easy rollable and lightweight to carry it anywhere. This mat has a very pungent smell of chemicals much stronger than natural rubber, but the company assures that the smell can fade away ones it is washed using detergent and water and drying in sunlight for a day. The only and the most doubtful factor is its durability. Since the surfaces are like beads joined together, there is a weak cross section at the joint which tends to get overstrained. This might lead to tearing at the joints if used continuously for sun salutation poses. Resultant forces exerted on the mat are inclined in such poses which the mat cannot withstand.